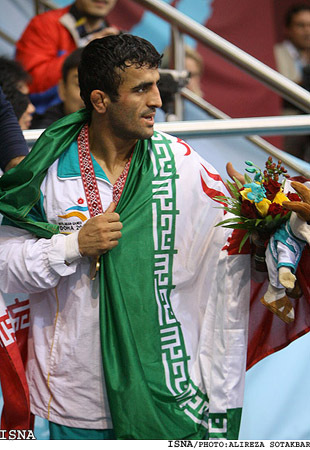 Morad Mohammadi wins a bronze medal in the 60kg freestyle wrestling to become the first Iranian medalist in the 2008 Beijing Olympics. Mohammadi beat Zelimkhan Huseynov of Azerbaijan 5-1 to secure the first medal for the Iranian squad in the 11th day of the Olympic Games. Mavlet Batirov of Russia beat Ukraine's Vasyl Fedoryshyn to take the gold medal in the same category. Japan's Kenichi Yumoto also beat Bazar Bazarguruev of Kyrgyzstan to win the shared bronze medal with Mohammadi. In the men's 55kg freestyle, Iran's Abbas Dabbaghi lost to Besik Kudukhov of Russia in the quarterfinals. American Henry Cejudo beat Japanese Tomohiro Matsunaga to win the gold medal. Kudukhov and Radoslav Velikov of Bulgaria took the shared bronze.